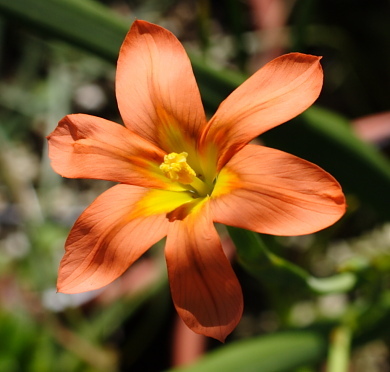 The genus Moraea can be divided into five groups: Galaxia, Gynandriris, Hexaglottis, Homeria, and Moraea. 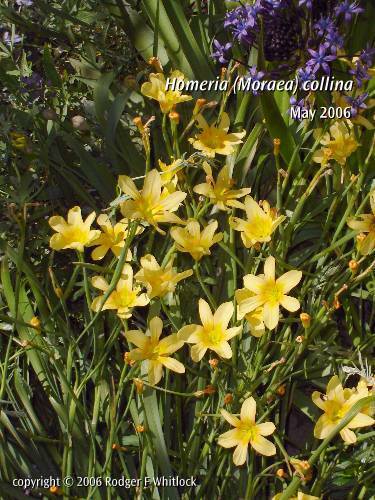 Homeria which was once considered to be a separate genus in the Iridaceae family is now included in Moraea. 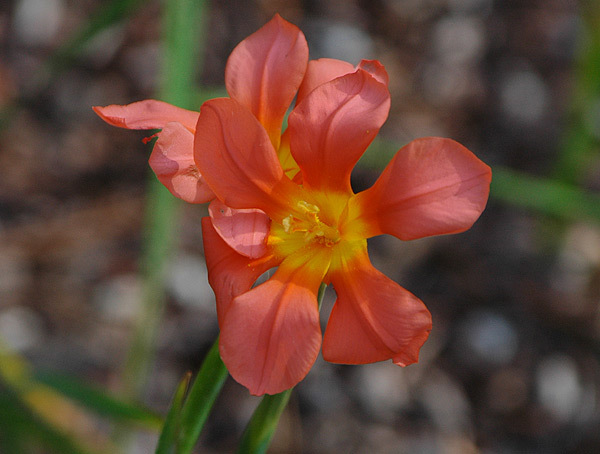 There are about 32 species of this Moraea subgroup native to southern Africa. 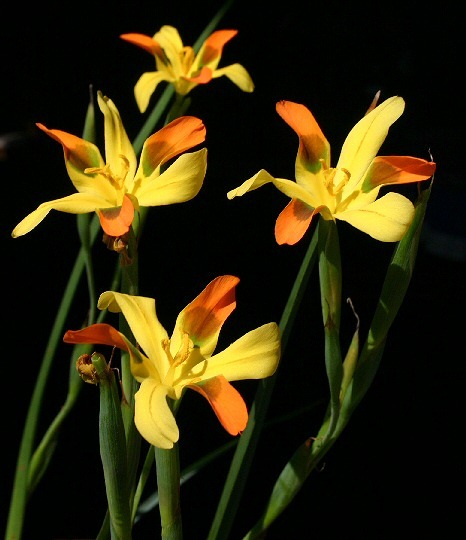 They have long narrow basal leaves, sometimes only one per corm and large yellow, pink, orange, or bicolor flowers with six fairly equal tepals. The leaves of some species can be poisonous and are avoided by sheep and cattle and can then multiply freely. Some species have a reputation of being weedy and they are not welcomed in Australia because of the agricultural concerns. In the United States, five species in the Homeria group are classified by the federal government as "noxious weeds:" M. collina, flaccida, miniata, ochroleuca, and pallida. It is not legal to import them or transfer them between states without a permit. Homerias are not very hardy so there is little danger of their becoming weedy in climates not to their liking, and even in mild climates like California they are not particularly aggressive in the garden. Although the flowers only last a day or two, some of the species produce flowers over a long period. 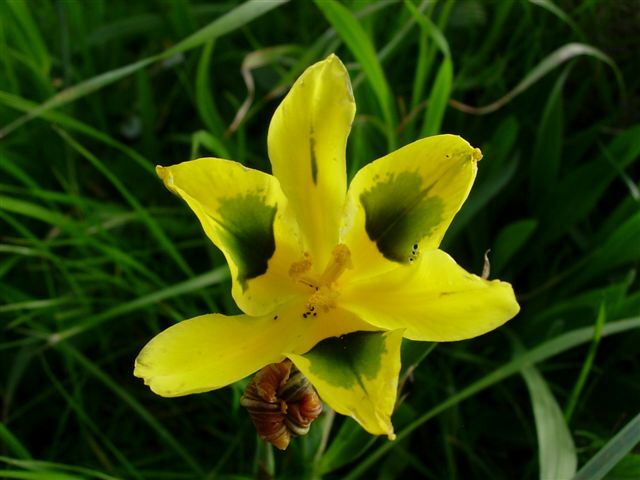 Information and pictures of the other Moraea groups can be found by clicking on these groups or the Moraea group pages listed below or found in the Moraea index where all species are listed alphabetically. Homeria subgroup species A-J are found on this wiki page. 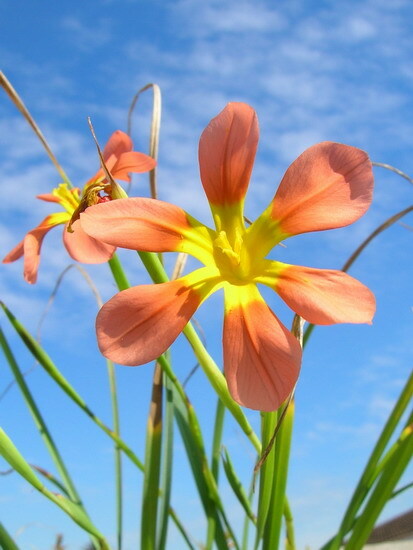 Moraea bifida (L.Bolus) Goldblatt (syn. 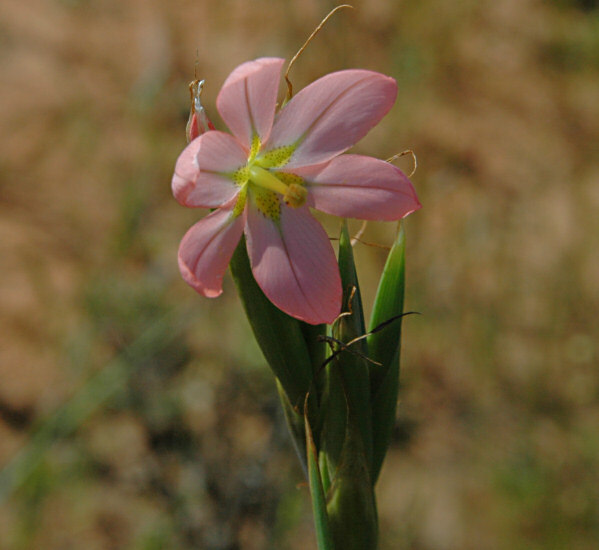 Homeria bifida L.Bolus) is found on clay flats in renosterveld in the western Karoo and Bokkeveld Mountains to Pakhuis Pass. It has one clasping channeled broad leaf and salmon pink or yellow flowers minutely speckled in the center with a bulbous filament column. The anthers cohere and conceal the style branches. The first two photos show plants photographed September 2006 by Bob Rutemoeller and Mary Sue Ittner in the Komsberg. 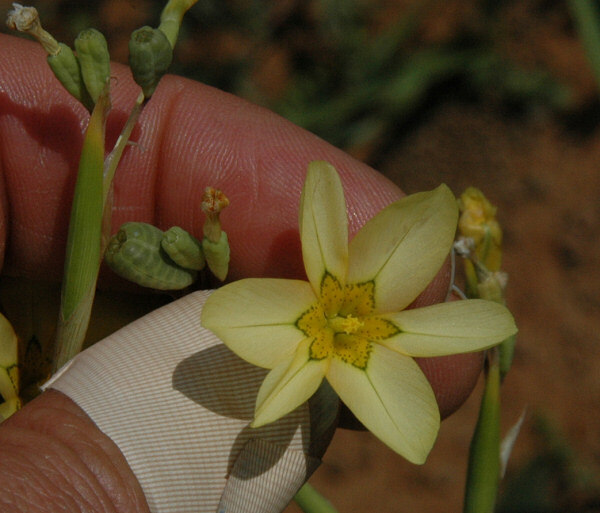 The third photograph taken between Calvinia and Nieuwoudtville September 2006 of a yellow flowered form by Bob Rutemoeller. This photograph also shows the seed pods and the bulbous filament column. 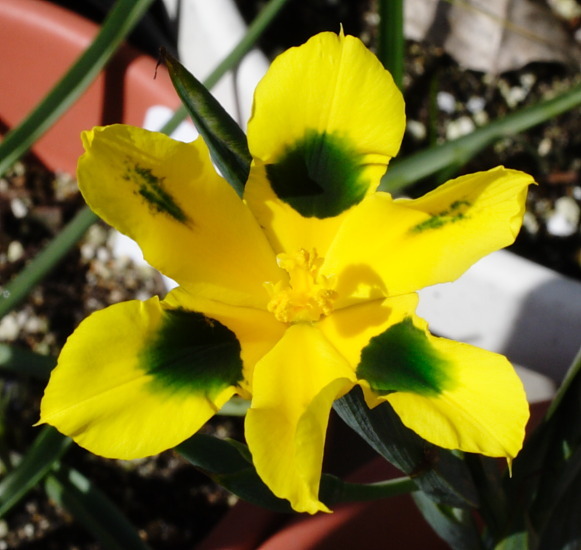 Moraea britteniae (L.Bolus) Goldblatt (syn. Homeria britteniae L.Bolus) is found on sandy slopes in the southeastern Cape. It grows 20 to 45 cm tall, has a single leaf that clasps the stem and pale yellow to cream flowers. It blooms September to October. Photos from Andrew Harvie taken in the Buffelsnek State Forest, southern Cape. Moraea collina Thunb. (syn. Homeria collina (Thunb.) Salisb.) 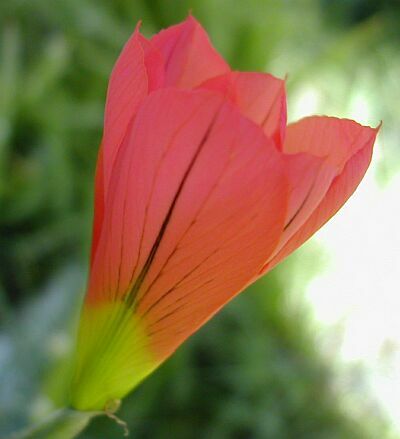 has a single linear leaf and yellow or salmon flowers. 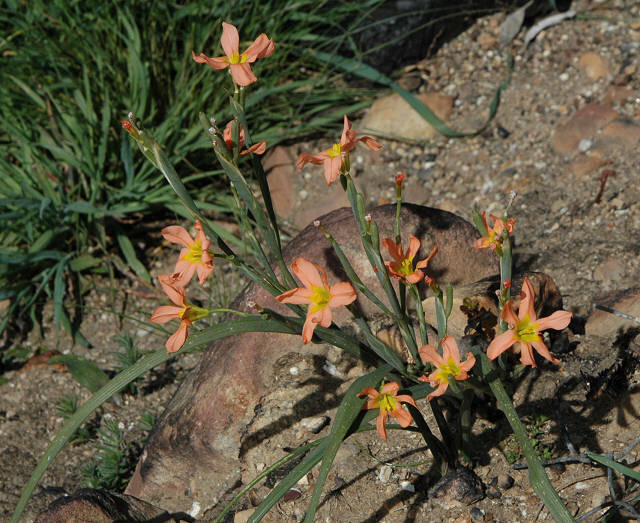 It is found on lower mountain slopes and flats on sand or clay in the southwest Cape. In Southern California, this species blooms late spring/early summer. It is a good "filler" growing where many other things will not grow, including full sun. The first photo was taken by Doug Westfall. The second photo from Dirk Wallace. The last two photos taken by Cameron McMaster near Napier in the Overberg. 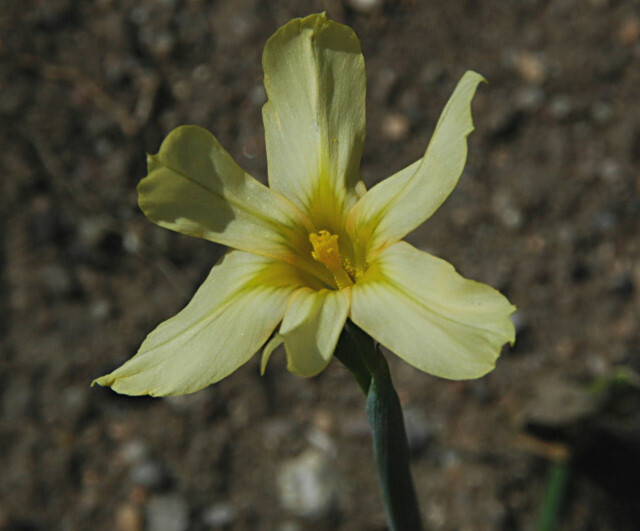 This little bulb came into the normal trade about 15 years ago, and is widely available as a mix of two color forms, a yellow and an orange. The plant is reasonably hardy in Victoria, British Columbia, but the hard freezes we get some winters kill most of the bulbs. As with many colored flowers, it is difficult to get an image that more or less accurately represents the color. The three photographs listed below are not technically perfect, but with a monitor set for a 9300K color temperature, the colors are fairly close to what you will actually see. Photos by Rodger Whitlock. 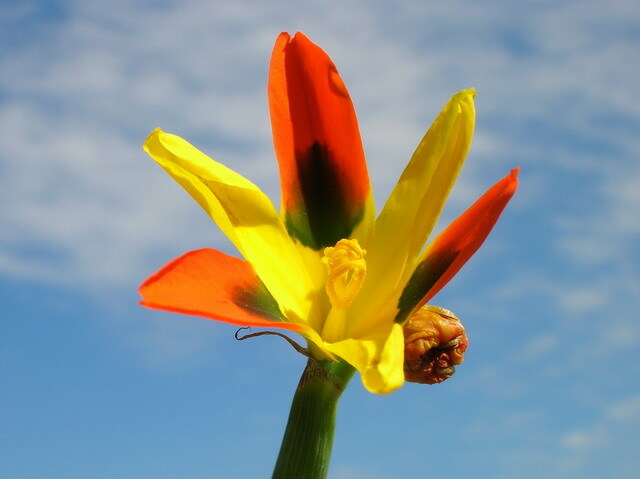 Moraea comptonii (L.Bolus) Goldblatt (syn. Homeria comptonii Goldblatt) is found in the Southwest Cape on clay slopes in renosterveld. It flowers in spring. 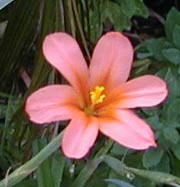 It has a single linear trailing leaf and yellow or salmon flowers with a yellow center. Tepals often have a large central green mark and are coconut scented. 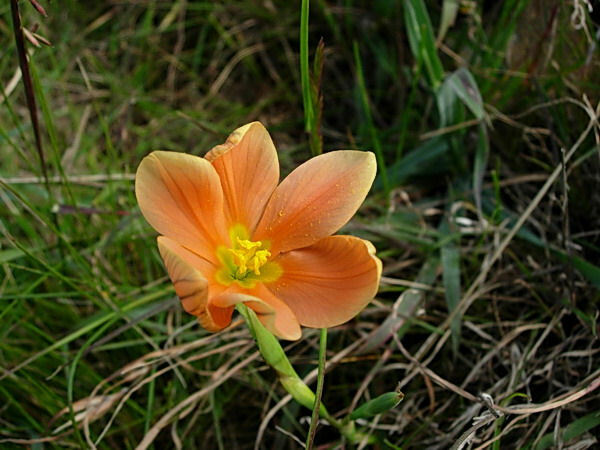 This species is very close to Moraea elegans. The main difference is in the shape of the tepals. The tepals of Moraea comptonii are widest in the upper third and in M. elegans widest in the lower third. 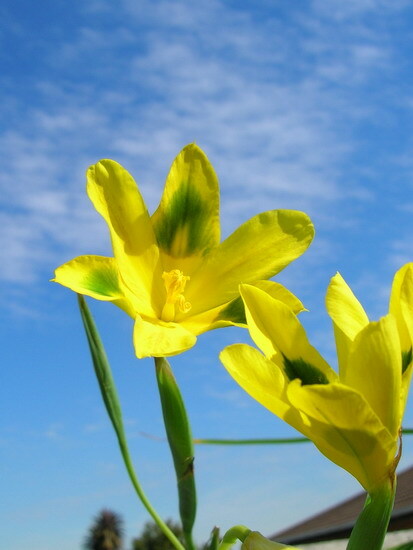 The anthers are longer than the style branches in Moraea elegans. 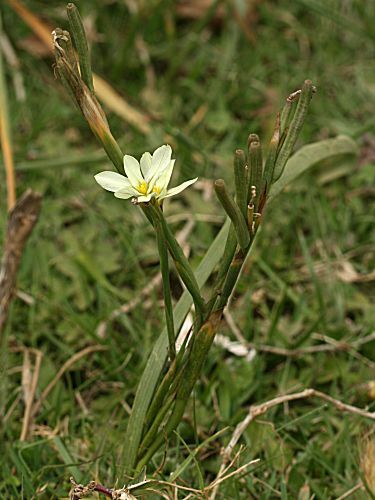 The first photo was taken at Wave Hill where it was identified as this species although it could be Moraea elegans. Photo by Arnold Trachtenberg. 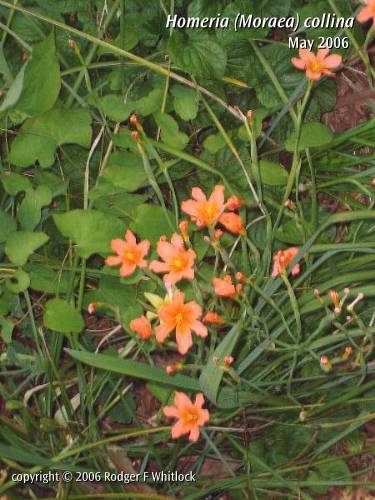 The second photo by Mary Sue Ittner was taken of orange flowered plants grown from seed blooming March 2006 in between rainstorms. The third photo is from Alan Horstmann. 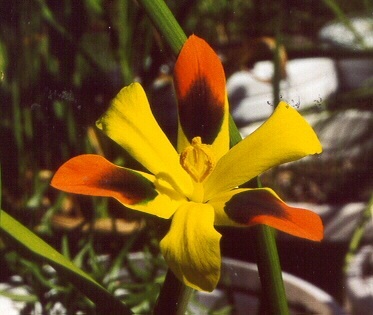 Moraea cookii (L.Bolus) Goldblatt (syn. Homeria cookii L.Bolus) is found on rocky sandstone slopes from the Cedarberg Mountains to Lesotho. 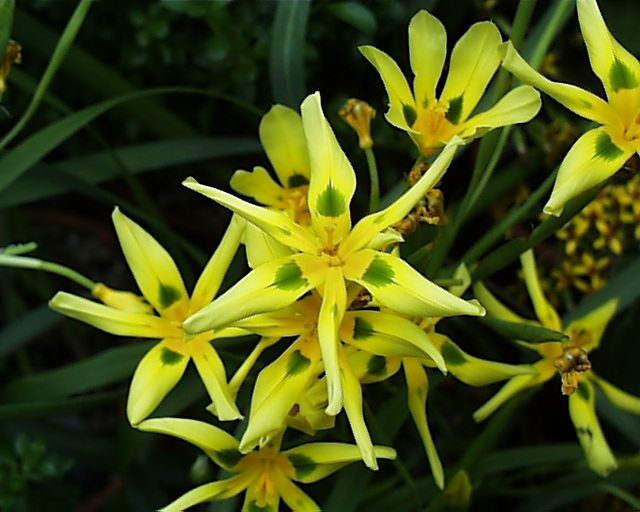 Growing from 30 to 80 cm tall, it has a single broad channeled leaf with undulating margins and yellow flowers with a darker yellow speckled eye on the outer lobes. 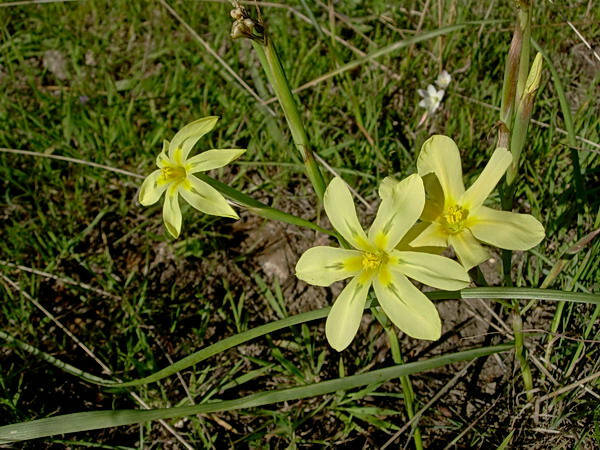 It flowers in spring (August-September); flowers are often abundant in burned seasonally wet areas. Photos and some text from the book Plants of the Klein Karoo courtesy of Jan and Anne Lise Schutte-Vlok. 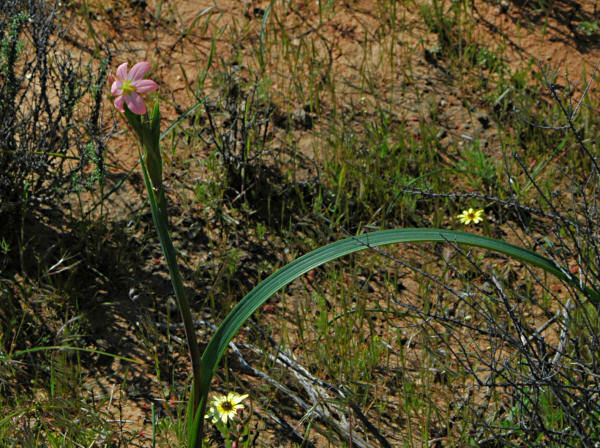 Moraea doleritica Goldblatt & J.C.Manning Distribution: known only from the Great Karoo, restricted to dolerite outcrops, 35-45 cm tall, one long linear channelled leaf, fugacious pale yellow flowers with deeper yellow nectar guides at base with fine dark dots, flowering mid-September and October; flowers opening early morning and collapsed by 11:00. 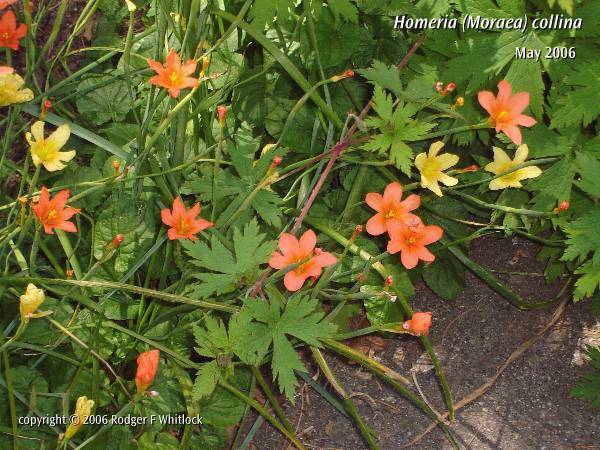 Named after Homeria was moved into Moraea so there is no synonym. 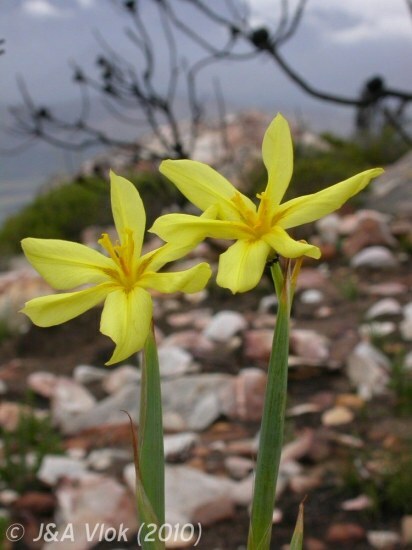 Moraea eburnea Goldblatt & J.C.Manning from the northern foothills of the Klein Swartberg, has a single, basal leaf and pale yellow flowers. 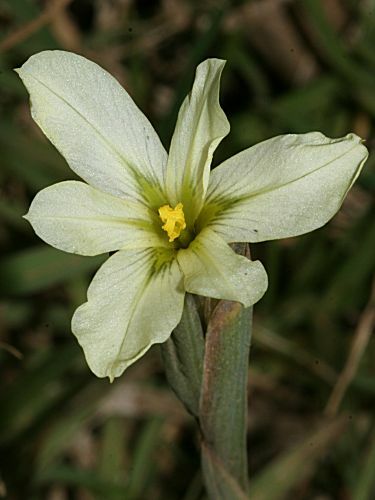 See Eight new species of Moraea (Iridaceae) from southern Africa with range extensions and morphological notes in the genus. 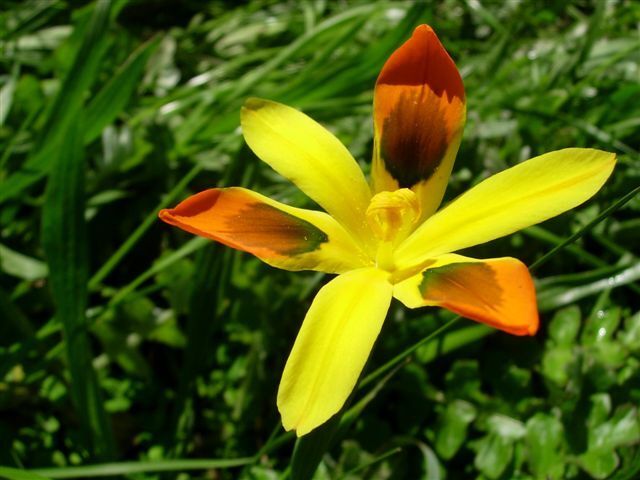 Moraea elegans Jacq. (syn. Homeria elegans (Jacq.) 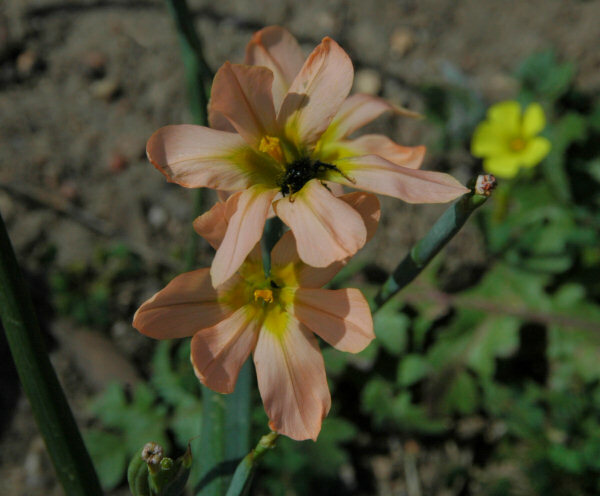 Sweet) grows on clay slopes in the southwestern Cape, blooming late winter, early spring. Peter Goldblatt of the Missouri Botanical Garden has reported that the dark markings attract beetles which pollinate the flowers. Moraea elegans is a very striking species, but one Mary Sue Ittner has found hard to keep going in cultivation. Michael Mace, gardening in a slightly drier/warmer climate, reports that the yellow and green form persists well in pots in his garden. First two photos by Mary Sue Ittner, third by Bob Werra, and fourth by Michael Mace. 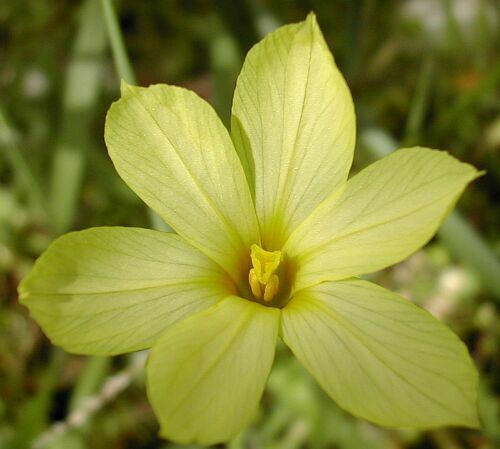 "On 13 August 2005 we came across a population of the very rare and localised Moraea elegans. We found these in the Napier district on a gentle slope below a drain from nearby arable fields and road. The population consisted of a large number of vigorous plants in all stages, but was confined to a small area (30 x 40 m) which benefited from the runoff from the drainage channel. 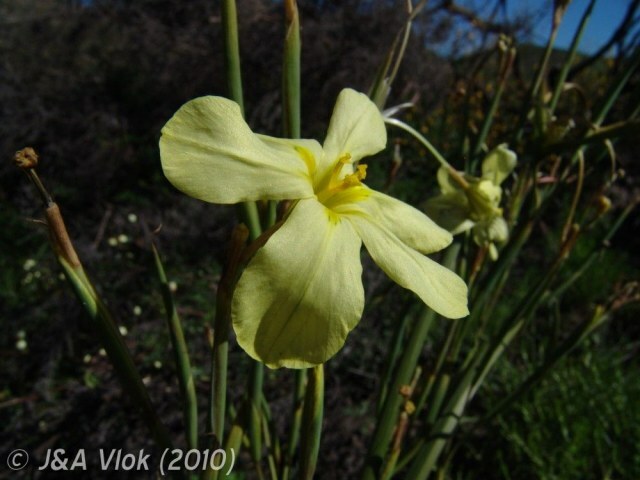 The habitat was therefore seasonably moister than the surrounding renosterveld." Cameron McMaster. Pictures from Cameron McMaster and Alan Horstmann illustrate some of the variations in colour. Moraea flaccida (Sweet) Steud. (syn. 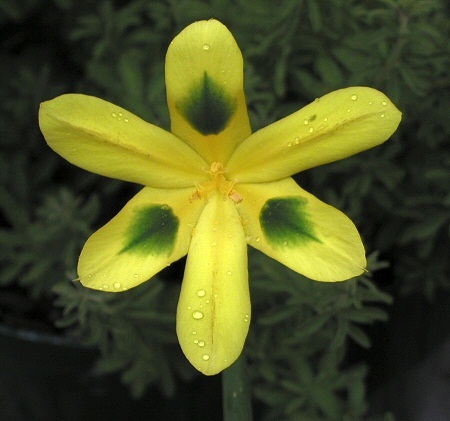 Homeria flaccida Sweet) has a single leaf and yellow or salmon flowers with a yellow center. It is found in wet sandstone and granitic slopes and flats, often in wet places in the northwest and southwest Cape and flowers in spring. First three photos by Mary Sue Ittner and Bob Rutemoeller taken on Lion's Head, September 2007. Fourth photo by Dirk Wallace. The last photo from Michael Mace, taken in captivity. Moraea hybrids in this subgroup are pictured on the Moraea hybrids wiki page.